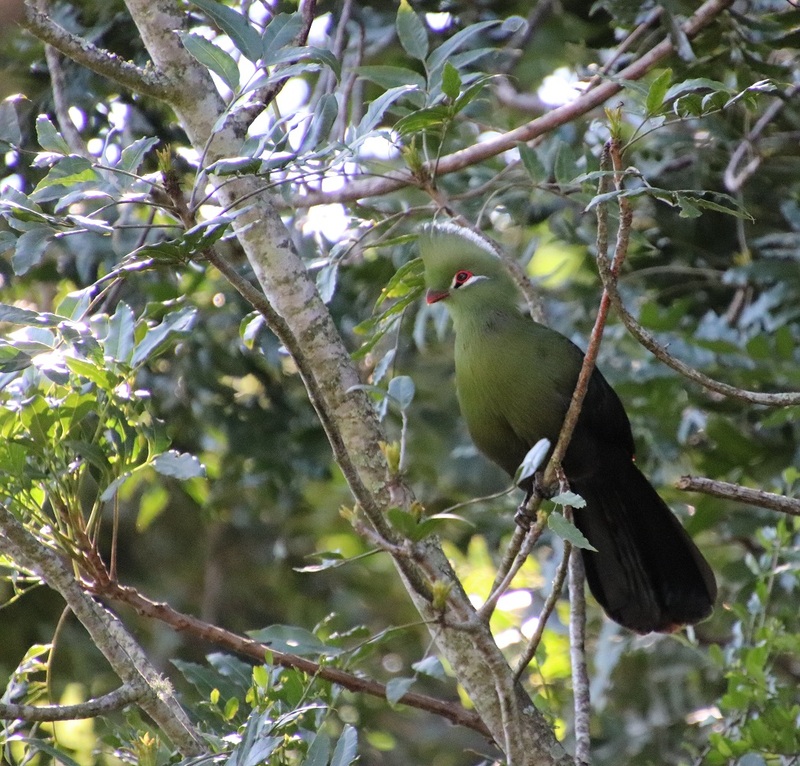 We hear the rasping korr-korr-korr call of Knysna Turacos (Loerie) in our garden almost daily, so we know they are there – somewhere in the foliage. These fairly large birds move soundlessly between the branches and from tree to tree, which means that we hear them more frequently than we see them. Sometimes a flash of red will catch my eye as one flies across the garden; only a flash mind you and then the bird ‘disappears’. 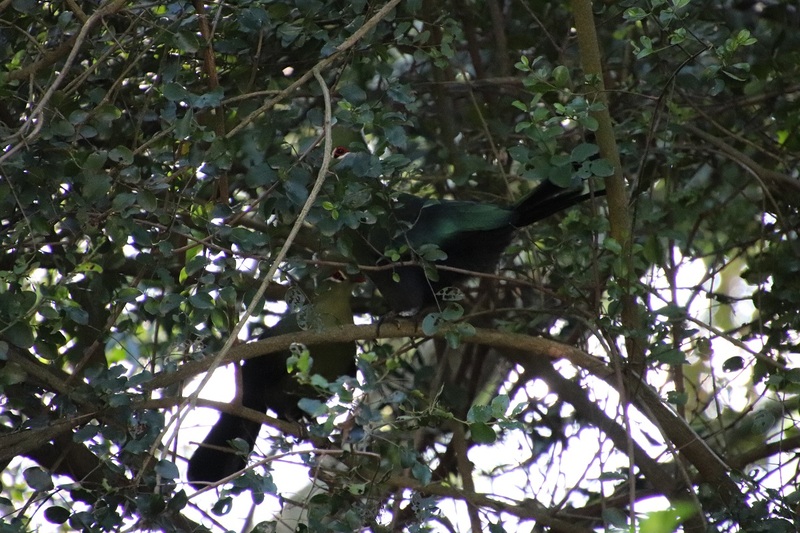 Imagine then how delighted I was when a pair of Knysna Turacos appeared in the Dogwood tree and gradually made their way down through the branches towards the bird bath situated not far from where I was sitting, camera in hand. They were tantalizingly close, yet so difficult to photograph! One looked at me obligingly while sitting absolutely still for several minutes. After I had been watching them for half an hour one of the pair disappeared in the direction of the fig tree. One moment it was there and the next it was gone. I thought the other had too, until it reappeared in the Dogwood, from where it kept an eye on me for another twenty minutes or so. What a handsome bird! Soon after, the other member of the pair appeared on my neighbour’s windowsill, where it spent some time looking at its reflection in the window. 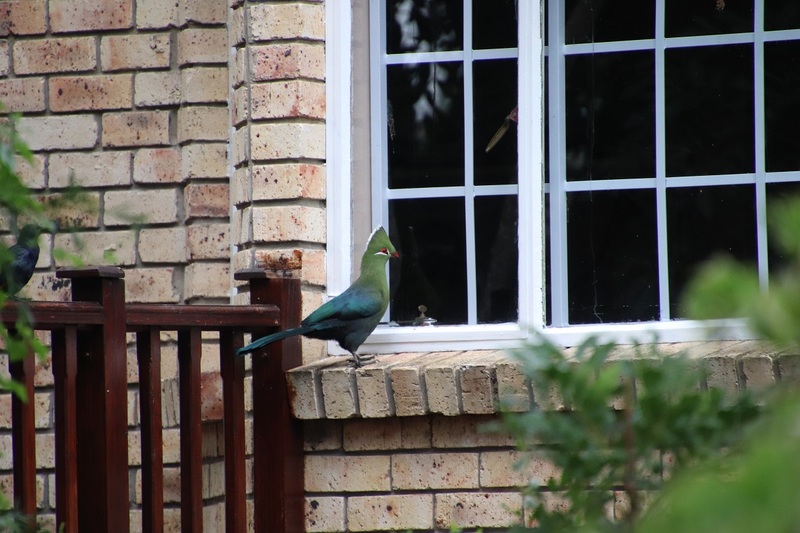 This entry was posted in Birds, Garden, trees and tagged Knysna Loerie, Knysna turaco. Bookmark the permalink. Oe, fantasties, Anne! Ek het nog nooit een baie goed gesien nie! Wat ‘n voorreg dat jy so ‘n mooi foto van die een in die boom kon neem. Dit is wel ‘n voorreg want hulle is selde in ‘n oop plek waar ek fotos van hulle kan neem. 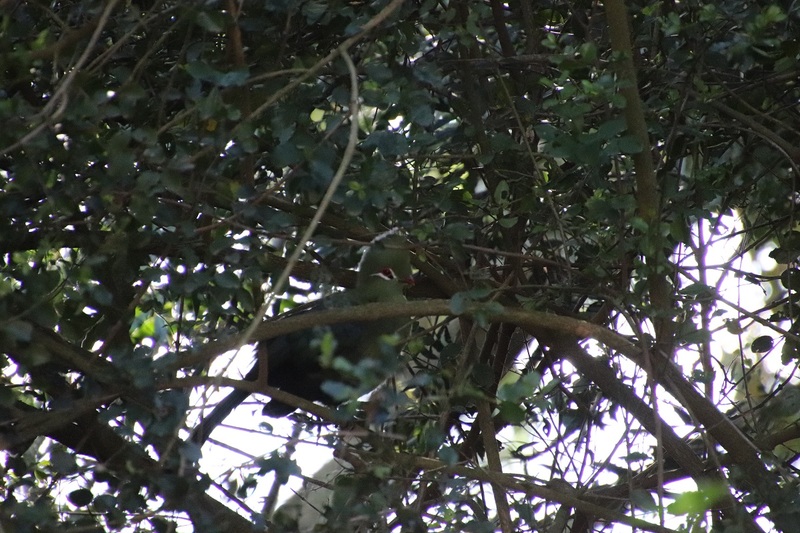 Dis dieselfde met bloukuifloeries…purple-crested turaco…kruip altyd weg! Great sighting of this very striking bird – so handsome! We feel honoured that this pair has chosen our garden as part of their territory. Oh, my, yes, so beautiful!! Wonderful that you were on the spot when they revealed themselves! It was particularly fortuitous that I had my camera at the time. Your patience is impressive, but the wait was worth it–for all of us. Thank you, Albert. They are beautiful birds worth ‘showing off’. What a wonderful thrill to have such beautiful birds frequent your garden, Anne!